Jim Campbell: New Work and Collaborations with Jane Rosen exhibition installation views at San Jose Institute of Contemporary Art. Photo: David Pace. 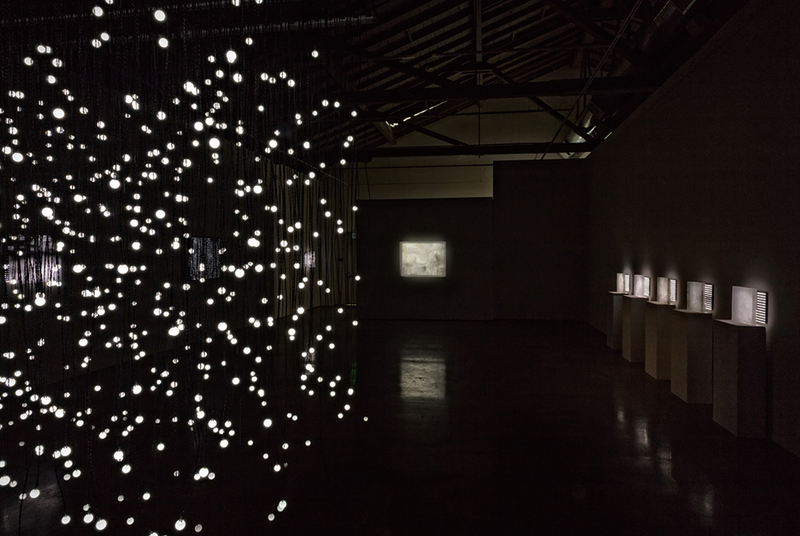 SAN JOSE, CA.- The San Jose Institute of Contemporary Art opened a major exhibition of compelling new work by internationally recognized Bay Area media artist Jim Campbell. Throughout his career, Campbell’s signature vision has been to explore the deep connections of light, space and time through the use of cutting-edge LED technology and custom electronics. Running through February 7, the exhibition includes a unique collaboration with noted sculptor Jane Rosen, and new a site-specific installation in the ICA’s Focus Gallery comprised of a 360-degree immersive moving image environment. In a visual world that is progressively defined by the highest possible definition, Campbell produces intriguing images that are at once recognizable and indistinguishable, providing a subtle challenge to the tech world’s constant pursuit of evermore crystal-clear resolution. His work tests our ability to perceive images by reducing the resolution and clarity dramatically. In this most recent work, Campbell has begun to “pull apart” his flat wall grids of evenly spaced LEDs to create a three-dimensional format. Working with Jane Rosen, Campbell further explores the three-dimensionality of his work by combining his light installations with her marble sculptures, which are inspired by her close associations with the natural world. During his career as a Silicon Valley engineer, Jim Campbell has received numerous patents for his pioneering research in HDTV and LED lighting, two technologies we now use in our everyday lives and that Campbell manipulates in his work. After graduating from MIT in 1978 with dual degrees in mathematics and engineering, Campbell went on to develop several patents for high-definition television technology. Concurrently, he began his artistic endeavors as a filmmaker and transitioned to interactive video installations in the mid 1980s. He has worked with LED technology since 1999. Campbell’s work has been the focus of solo exhibitions throughout the world including shows in the United States, Argentina, Denmark, Japan, China, Australia, Germany, and Russia. His work is included in distinguished public collections throughout the country including the de Young Museum, the Los Angeles County Museum of Art, the Museum of Modern Art, the Fisher Collection, the Smithsonian Museum of American Art, and the Metropolitan Museum, among many others. Numerous public commissions include the San Diego Airport, Madison Square Park in New York City, the Dallas Cowboys Stadium and the new San Francisco central subway in Union Square. In 2012, Campbell received the American Academy of Arts and Letters Award and SFMOMA’s Bay Area Treasure Award. Posted on The Art Daily. I have chased this watch so much as its a present, for my daughter's rolex replica sale, now I'm stuck as I can't give her a watch that she is unable to wear because it won't do up. Is there any way this can be rolex replica uk for a watch that is wearable?? Also if the watch doesn't have Swiss made under the 6 like the picture, can you send a similar one that does have omega replica made written on??? As long as it's a ladies an a pretty face I cartier replica sale don't mind. I just need it as fast as possible as her birthday is July 13th. Well-built, innovation, hublot replica uk are labels; careful fake watches, pioneers, is replica watches uk human spirit. Tour of the site design using the latest 2014 global image, in modern city night sky, lit orange www.hublotreplicauk.co.uk personality. New image to the city, ocean, desert, sky as the background, the brand's iconic orange box silhouetted against the fake watches sale of the screen - the courage to open up people's hearts symbolizes the moment is to control the aggressive urban and wilderness, good times and swiss replica watches source of power. Basel is definitely the female form this year bloom, although many people think last year has been the rise of the female form, but this year saw a huge lineup of Basel female form female form just know that this year is the year.